Leopoldine "Leonie" Rysanek (14 November 1926 – 7 March 1998) was an Austrian dramatic soprano. Rysanek was born in Vienna and made her operatic debut in 1949 in Innsbruck. In 1951 the Bayreuth Festival reopened and the new leader Wieland Wagner asked her to sing Sieglinde. He was convinced that her unique, young and beautiful voice, combined with her rare acting abilities, would create a sensation. She became a star overnight, and the role of Sieglinde followed her for the rest of her career. Her final performance was at the Salzburg Festival in August 1996, as Klytämnestra in Elektra. Her Metropolitan Opera debut came in 1959 as Lady Macbeth, replacing Maria Callas who had been "fired" from the production. She made her farewell to the Met as the Countess in The Queen of Spades in January 1996. Over her lengthy career, she sang 299 performances of 24 roles at the Met. She starred in the Met premieres of Macbeth, Nabucco, Ariadne auf Naxos, Die Frau ohne Schatten, and Káťa Kabanová. In 1951, she was the first Sieglinde of the new Bayreuth Festival in Die Walküre under Herbert von Karajan. From then on, she became one of the brightest stars of the new opera theatre, the German "Musikdrama". Wagner made her career, but it was perhaps as a singer of Richard Strauss's operas that she made the largest contribution to modern opera. She was the reigning Empress of Die Frau ohne Schatten and triumphed as Salome, Elektra, Chrysothemis, the Marschallin and Ariadne. But the Empress was a very special role for her: the opera became a part of the regular repertoire in her time, and she created the part in many opera houses, first and foremost the Met and the Paris Opera. She was appointed curator of the Vienna Festival a few months after her retirement, a post she held until her death in Vienna at age 71 (she had been diagnosed with bone cancer during her last Met performances). Two days later, a Metropolitan Opera production of Lohengrin with Canadian singer Ben Heppner in the title role, was dedicated to her memory. In that opera, she played the role of Ortrud in the 1985-86 production. Leonie Rysanek's voice was astride the spinto and dramatic soprano voices in certain roles. Although her voice fell in the upper end of the jugendlich-dramatisch and dramatischer sopran categories in the German repertoire, it was exclusively dramatic by Italian operatic standards. In the octave just above middle C, the voice could occasionally sound dry with wobbly intonation, but at the top of the staff it blossomed into one of the most glorious sounds of the twentieth century. Her endurance in the high tessitura of Strauss' operas is legendary. She excelled in the music of Richard Strauss. She was especially successful as the Empress (Kaiserin) in Die Frau ohne Schatten, the title role in Salome, the Marschallin in Der Rosenkavalier and Chrysothemis in Elektra. She occasionally sang Ariadne/Prima Donna in Ariadne auf Naxos and female leads in Strauss operas rarely staged (Die ägyptische Helena and Die Liebe der Danae). However, cautious of playing out of her league, she didn't tackle Salome until 1972 when she was 46, although she kept the role of Sieglinde in her active repertoire from her early 20s until age 62. She avoided offers to sing Isolde in Wagner's Tristan und Isolde despite speculation that the role would be perfect for her. She sang Brünnhilde in Die Walküre in 1950 in Innsbruck but did not return to this role. 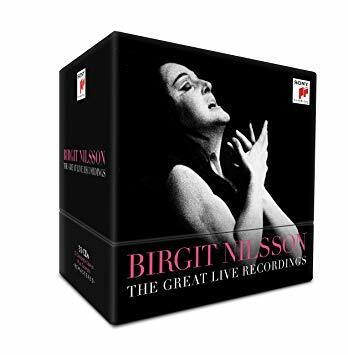 She stated in interviews that her great respect for her colleague Birgit Nilsson was a factor in her avoidance of that soprano's signature roles. Extraordinarily, one of her performances in Die Walküre took place in the same week as her appearance as Gilda in Rigoletto. This little-known feat equals the more often cited accomplishment of Maria Callas, who once performed Die Walküre and Bellini's I puritani within the same week. Strauss sopranos often make excellent Puccini voices and accordingly Rysanek sang many Toscas and a few Turandots. She also sang a remarkable Leonore in Beethoven's Fidelio. In Wagner, she sang many Tannhäuser Elisabeths and Lohengrin Elsas, a few Ortruds in her later career - she virtually owned the role of Senta in Der fliegende Holländer for two decades, but the role in which she was most revered, in addition to Strauss's Kaiserin and Chrysothemis, was Sieglinde in Die Walküre. Such a powerful, well-projected, and expressive voice as Rysanek's allowed her to sing many Verdi leads, notably Desdemona in Otello, Lady Macbeth in Macbeth, Amelia in Un ballo in maschera, Elisabetta in Don Carlo, Leonora in La forza del destino, and Aida. She also sang Abigaille in the Metropolitan Opera's first staging of Nabucco in 1960. She found this last role uncongenial, and the strain of performing it numerous times during that season brought on something of a vocal crisis, from which she successfully recovered. The overall nature of Rysanek's voice is particularly evident in her 1959 recording of Lady Macbeth, when she was in her prime at age 33, where her somewhat hollow lower register is combined with soaring, dramatic power in her upper range, with strong skills at negotiating Lady Macbeth's upper range coloratura. As an Austrian and a Mitteleuropäerin, Rysanek also took an interest in music from Slavic countries, both Russian (Tchaikovsky) and Czech (Smetana, Janáček). Of the notorious five "biggest" soprano roles, Rysanek sang Turandot and enjoyed success as Kundry in Parsifal at the Met, Vienna, and the Bayreuth Festival. Starting her career when Kirsten Flagstad was still alive and Birgit Nilsson and Astrid Varnay at the peak of their vocal abilities, Rysanek knew better than to go for Wagner's Isolde or any of his three Brünnhildes. However, in 1981, Karl Böhm persuaded her to sing Elektra for a Unitel film (with the soundtrack recorded in the studio), not a live production in an opera house. In her later years, and like many "big" soprano voices, Rysanek reverted to dramatic mezzo-soprano roles like Ortrud in Wagner's Lohengrin, Herodias in Strauss's Salome, Klytemnestra in his Elektra and the Kostelnička in Janáčeks "Jenufa".